304 pages | 25 B/W Illus. Given the increased attention by clinicians, researchers and the pharmaceutical industry to the management and treatment of dementia not only in the elderly but also in increasingly younger populations, the demands for effective evidence-based pharmaceutical control of dementia and quantitative assessment of outcomes have increased. Since some first steps in the early 1960's to the controversial landmark paper of Summers and colleagues, to the most recent trials, it is clear both that much progress has been made, and that much remains to be done. This book is written to take stock of what is now usefully known, and to speculate on directions for the future. "…a thorough and thoughtful examination of a complex area….a milestone in describing the playing field upon which drug trials of Alzheimer's disease should be conducted. It is a testament to how all the measures used to diagnose Alzheimer's disease do not equally gauge the progression of the disease. Alzheimer's disease is not monolithic, but varies greatly from stage to stage. This book promotes new ways of approaching this aspect of the disease." Introduction. 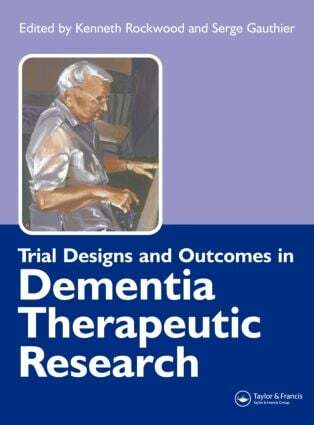 The History of Therapeutic Trials in Dementia. Therapeutic Strategies. Treatment Hypotheses. Clinical Trial Designs & Selection of Primary vs.Secondary Endpoints. Qualitative Analyses of Disease Treatment Effects. Inclusion and Exclusion Criteria. Global Outcomes. Cognitive Outcomes. Functional Outcomes. Behavioral Outcomes In Trials Of Cognitive Agents. Quality of Life Outcomes. Caregiver Burden Outcomes. Neuroimaging Outcomes. Additional Lessons From Trials in Vascular Dementia. Additional Lessons From Trials In Dementia With Lewy Bodies. Lessons From Trials To Prevent Dementia. Herbal Treatments for Dementia. Lessons from Trials of Psychoactive Compounds in Alzheimer's Disease. Lessons from Non-Pharmacologic and Psychosocial Interventions for Patients with Dementia. Lessons from Psychosocial Interventions Aimed at Caregivers of People with Dementia. Lessons from Trials in Mild Cognitive Impairment. Pharmacoeconomic Outcomes. Executive Dysfunction in Dementia. Ethical Issues. Conclusions.